As a Physical Therapist in Kentucky, you must complete 30 continuing education hours every two years by March 31st in odd years. Physical Therapist Assistants in Kentucky are to take 20 continuing education hours every two years as well. The Kentucky Physical Therapy continuing education requirements are listed in detail below. Therapists must also complete an open book jurisprudence exam in Kentucky before March 31 of odd years when renewing applying for a PT license. This counts towards 2 hours of the continuing ed requirements for Kentucky. 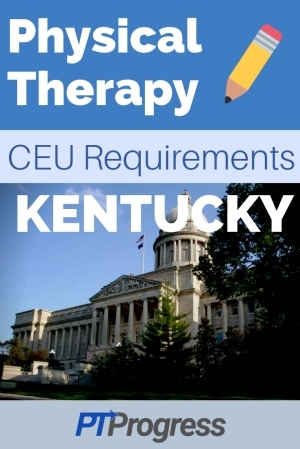 What CEU Courses are Allowed in Kentucky? Courses produced & developed by the APTA or its state chapters and sections, which are less than three hours in length are approved as Category 1 education. Any course not meeting the above criteria is considered Category 2 and does not require an application for approval. Can I Use MedBridge in Kentucky? Yes, you can use an online CEU company like MedBridge to complete required CEUs for your Kentucky Physical Therapy license renewal. A quick check on the MedBridge website shows hundreds of approved courses for Kentucky PT license holders looking to renew their license. When does my Kentucky Physical Therapy license expire? All Physical Therapy license expires March 31 of odd years. The renewal period is open from November 15 and closes January 31. How long does it take to renew a Kentucky Physical Therapy license? It can take 4-6 weeks to process your request, so be sure to start the process early! Do I need malpractice insurance as a Physical Therapist in Kentucky? While the KPTA does not publish recommendations on malpractice insurance, it’s still a good idea to have coverage. Some states require policies that provide coverage of “$100,000 per claim” with a recommended minimum annual aggregate or total coverage of no less than $300,000 for all claims made during the policy period. Take a look at our recommended Physical Therapy malpractice insurance article to learn more about coverage. Take a look at all of the requirements for CEUs based on your state in this comprehensive article.